Curtis Stone’s slow-cooker pork roast recipe and party tips! Curtis Stone's perfect slow-cooker pork roast recipe, plus party tips! The secret to an incredibly easy casual party? 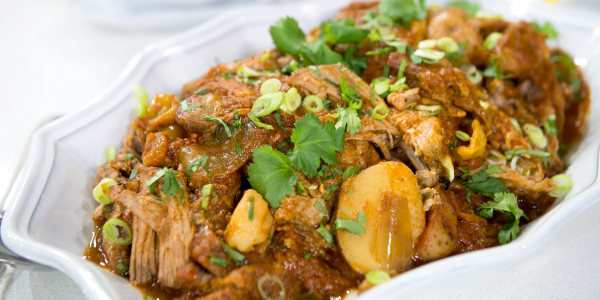 Let the slow cooker do most of the work and make my Mexican-Style Slow-Cooker Pork Roast with Chipotle Sauce, a recipe that requires very little active prep time, so you can set it and forget it. This recipe calls for pork shoulder, an inexpensive cut of meat that tastes like a million bucks when done. The dish makes a great main course for casual get-togethers since it can be made ahead and served at your leisure. It's great for game day fare and it makes great leftovers. 1. Stick to what you know. Don't try something on your first dinner party that you've never made before. Instead make something that you're comfortable with, but take it to the next level by giving it a small, fun twist. 2. Prep ahead. Start shopping and prepping a day ahead so you can enjoy the party with your friends. 3. Cook from scratch. Homemade food is always more impressive (and less expensive!) than store-bought, and if you follow the first rule, you can make a delicious meal without making yourself crazy. 4. Have lots of wine or (craft beer) on hand: Food tends to taste better with a little wine or beer, and you can talk with your guests about the pairings you’ve chosen. 5. Have fun. The best hosts enjoy the party. If you're not having fun, your guests aren't having fun.